“Swimming is a form of locomotion employed by many organisms across a wide range of scales in nature. Microorganisms with small mass that encounter dominance of viscous forces in the medium require a change in shape that does not vary with time to achieve fluidic propulsion aligned with hydrodynamics. To overcome this challenge, unicellular flagellates of the Euglena family evolved a characteristic movement known as ‘euglenoid movement’ in which the body significantly changes shape, allowing the organism to navigate through viscous fluids and tiny spaces. This ability to change the body shape and move through constrained spaces and cluttered environments is particularly attractive in engineering biomimetic robots. Example applications of miniature robots include movement through biological fluids during medical procedures in vivo and navigating through rubble in external environments during search and rescue operations of survivors. Inspired by euglenoids, Krishna Manaswi Digumarti and co-workers at the Department of Engineering and Mathematics presented the design and development of EuMoBot, a multi-segmented soft robot. The biomimetic robot could replicate large body deformations for locomotion. In the study, the scientists engineered two robots at different sizes to operate with a constant internal volume. The engineering protocol made use of the hyperelasticity of fluid-filled elastomeric chambers to replicate the movement of euglenoids. Of the two, the smaller robot moved at a speed of 1/5 body lengths per cycle, while the larger robot moved at a speed of 1/10 body lengths per cycle. The study showed how soft biomimetic robots could be employed to change shape and replicate biological motion, while acting as a tool to study biomimetic robots. The scientists also presented a quantitative method based on elliptic Fourier descriptors to characterize and compare the robot’s shape with its biological euglenoid counterpart. The results showed 85 percent similarity in shape, indicating that the engineering technique was applicable to develop miniature robots. The method allowed the scientists to understand the evolution of shape in nonlinear, dynamic soft robots that did not have a specific shape to be modeled by. The results of the study are now published in the Journal of the Royal Society Interface. Biomimetic engineering strategies have inspired researchers to seek designs from the animal kingdom and create biologically inspired robots. Euglenoids are unicellular flagellates, extensively studied in the lab as models due to their plant-like and animal-like character. The organisms use unique strategies to swim at low Reynolds numbers and studies on their locomotion are relatively recent. The cells of the organism are typically equipped with one or more flagella to swim, while also exhibiting a second type of slower movement termed euglenoid movement, in which the cell undergoes a dramatic change in shape. In the present study, Digumarti et al. used the second form of movement to engineer a soft, functional robot based on the behavior of the microorganism. The evolutionary reason for the observed change in shape during euglenoid movement is unknown, although it is believed that deformation in cell size arose in response to strong stimuli such as light, heat, chemical shock or contact. When the microorganisms were placed in a fluid-filled microscopic maze resembling their natural environment, many showed euglenoid movement, suggesting the motion was well-suited for constrained environments. Motion of this nature can be useful for a bioinspired robot in the field of soft robotics to traverse through cluttered environments using large-body deformations. In the study, the authors presented the design, actuation principle and method of fabrication to engineer EuMoBot, a soft robot demonstrating euglenoid movement. Locomotion through a fluid was quantified relative to the natural microorganism’s motion. Since the underlying mechanisms of shape change were previously studied in detail, Digumarti et al. focused on the macroscopic shape of the euglenoid in robotic form without replicating changes at the microscopic level. To generate soft fluidic actuators, the researchers designed a novel bellows-like device called the ‘hyper-elastic bellows’ (HEB) actuator as previously detailed by the same research group. The engineers formed the shape of the actuator using a 3-D printed mold. They fabricated two robots at different sizes. They cast three actuator chambers, followed by elastomer mixed with pigments injected into the mold to cure overnight and form a translucent white enclosure. The bioinspired soft robot contained an inflating/deflating chamber to replicate the euglenoid shape and achieve similarity in motion. To test locomotion of the engineered robots, the researchers placed them in a tank filled with a solution of methyl cellulose in water. The robots in each experiment had a constant inner volume, and their internal fluid moved from one chamber to the next, reproducing the motion of an expansion wave characteristic to euglenoids. Both robots showed capacity to swim by changing the shape of their body. The disparity in speed depended on the volume of fluid pumped through the chambers of the soft robot. The scientists observed the hydrodynamic similarity between the soft robot and the microorganism relative to Reynold numbers at both sizes. The soft robot was not merely limited to working in a fluid environment as its biological counterpart, with capacity for multi-modal movement on a flat table and climbing a pipe using non-constant volume of operation. The robot employs a feedback-based approach for autonomous control, removing the need to model dynamics of the pump and flow of fluid within the robot. A machine-vision estimate of chamber-size via a camera and MATLAB script provided feedback. The system used the expansion and contraction of each chamber to control the fluid flow inside the robot. Sensors within the robot allowed direct measures of the fluid pressure. Shape estimation of the robot was accomplished with mathematical descriptors extracted using previous video recordings of the organism. 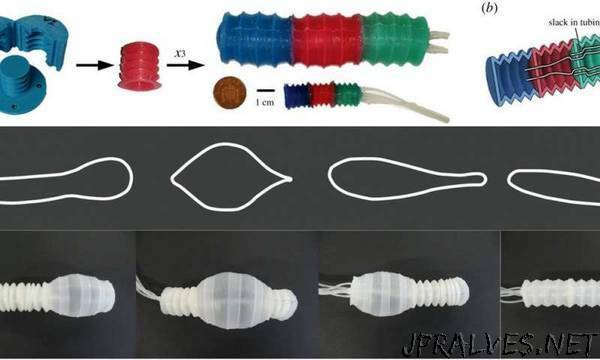 The scientists used the elliptic Fourier descriptor for closed contours to describe the shape of a hyper-elastic soft robot and compared it with a biological organism for the first time in the study. The elliptic Fourier descriptor was extracted in four main steps to estimate the shape of the object. The amount of variance in the shape captured by an eigenvector was used to quantitatively measure the similarity in shape between the robot and the organism. The shape of the euglenoids were distinctly characterized by the first three principal components, while the variance in the robots was spread across more components, suggesting that the extreme shapes of euglenoids were not fully reproduced in the robots. Based on the eigenvalues, the larger robots reproduced shapes closer to the euglenoid compared to the smaller robots. The reason for the observed difference may be due to the design of the folds of the bellows (Hyper-elastic bellows—HEBs). Parameters of the fold angles, their number and density can be further optimized to achieve better shape replication. Compared to natural microorganisms, the robot did not produce a smooth shift when transitioning fluid from one chamber to another, potentially since the synthetic boundary wall despite its elasticity may locally restrict chamber expansion. This may also explain the robot’s inability to assume extreme shapes.